Welcome to How it works, a new and (hopefully) illuminating series on many of the techniques that I, as a biologist, am familiar/somewhat familiar/not at all familiar with! Read on, but be prepared to learn! So, in the last How it works, I talked about PCR. PCR, as you may recall, stands for Polymerase Chain Reaction, and is a way of making a lot of copies of DNA, very fast! Seriously, once you know your sequence and have a couple strands of the DNA, you can go from 2 strands all the way up to 20,000 strands, all identical, in an hour or less. You’re a researcher, working on, for example, fingers! You go out and take a bunch of DNA samples from six-fingered people (this condition is actually called polydactyly), and compare the DNA sequence to that of normal, five-fingered people. You compare the DNA using sequencing, which will be explained in another episode. So, you hypothesize, if a person has a T in this spot on their DNA, instead of an A, they grow six fingers instead of five! But you can’t just call it quits now – you don’t have any experimental proof, nothing to show that this isn’t just coincidence. So you decide to do an experiment! Now, first off, you can’t go around giving people extra fingers (unless you’re a mad scientist or something, in which case feel free). So instead, you look at mice, and notice that they have this exact same gene. Great – there’s no problem with giving mice extra toes! Search through millions of mice until you find some that have extra toes, and extract their DNA and see if it shows that same mutation A -> T.
Take normal mice, use a technique called Site-Directed Mutagenesis, or SDM, to change DNA from them to have the T instead of the A, and see what happens when you put it back into new mice. Do you know which path is best? Here’s a hint: we want the method that doesn’t involve searching through millions and millions of mice, counting toes. We’re taking door number 2! As you recall, PCR works by separating the two DNA strands, attaching primers to each strand as starting spots, and then synthesizing the rest of the DNA in the complementary strand, building off the primer. SDM works almost exactly the same way – but with one difference. Another primer is included! On this picture, ignore the red circles, but look at the two strands of DNA (black lines) with the SDM primers (blue lines) attached. See how the blue lines have one base that is incorrect, making them kink away from the DNA? That’s intentional! Now, after the first round of DNA synthesis, the new strands, made from these primers, will have that mutation, that single changed base, as a part of them! And because every DNA strand will be made with these altered primers, 99.9% of the DNA from the reaction will be mutated, just as you wanted, instead of containing that original A instead of T.
So after reading this, hopefully you’re starting to see a bit of the power of PCR – not only can it make thousands of copies of a single piece of DNA, but it can also be used to introduce very specific changes at exact locations! And all of this can happen while you take your lunch break, you productive researcher, you. Warning: Damage at critical levels. Diverting power to core processes. Wait, what? No, hold on! I can almost reach the switch . . .
Booting primary subroutines and personality core. Ow… oh man, my head is killing me. What happened? All systems active. Performance nominal. Ugh. I hate waking up like this. When I’ve watched the old movies, the main character sometimes sits up, clutching his head, on the morning after a hard night of drinking. I don’t drink, of course, and the alcohol wouldn’t have much effect even if I did. Thanks, super-efficient liver. Thanks for not letting me get drunk for more than ten minutes or so at a time, at the cost of an entire bag of booze. But anyway, I imagine that those old people, after their heavy nights of drinking, felt something like how I do now. Anyway, let’s see. Time to see if the muscles in this body are any good. I’ll just reach up for the handle to the pod that I’m in, and ta da! One push, and the door is open. My muscles feel a little wobbly, but nothing too bad. I should be able to walk. Thud. Freaking ow. Okay, maybe the neurons are still compensating a little, and I don’t yet have full control. Luckily, there was this hard metal med bay floor to break my fall. Let’s try this: I’ll reach out for the operating table, anchored in the middle and fortunately unoccupied, and use it to pull myself up. There, that works great! Now that I’m sitting here in the middle of the med bay, waiting for my new brain to get acquainted with my new body, I wonder where the doctor is. Ugh, memory’s still fuzzy, long-term connections aren’t all there yet, but I can picture his face. Bearded fellow. A little tall, for a crewman, but doctors are always in high demand, and he can get on a ship even though he stretches the acceptable size limits. I can’t quite recall his name, though. Beard-man? Beerman? Berlman? I think that last one’s it. “Berlman?” I call out, my voice still a little raspy. Yeah, definitely still need more connections to finish wiring themselves inside my head. All reboots are supposed to be perfect copies, up until the last few seconds, but nothing’s ever quite as good as it sounds. No answer. That’s really odd. Now, I can remember Berlman a bit better, including his belligerent attitude. He rules over this sick bay like a lord, and he’d never leave it alone this long. Especially if someone’s rebooting. Speaking of which, I can’t remember why I rebooted. This is really strange. Fortunately, my legs seem to be working all right now. Time to go find some answers. Author’s note: This is part of an installment on how many methods and techniques in biological sciences work, written for educational purposes! Hopefully, this blog will rise to be something more than silly short stories. If you’ve ever worked in a biology lab, you’ve probably heard professors, researchers, or even other students talking about PCR. But what in the world is this strange acronym? PCR stands for Polymerase Chain Reaction, and is a method for amplifying DNA! This process can take a few strands of DNA, or even a single strand, and turn it into thousands of (nearly) identical copies! Although it has a few limitations, it is a very rapid, powerful tool, and has many different uses. So, you may be wondering, how does PCR work? It’s simple, and all depends on temperature. But first, a little refresher on DNA. DNA is made up of two strands, each of which is complementary to the other. Because they are perfectly complementary, they fit together, bonding perfectly. Think of it like ripping a piece of paper in half – the two pieces of paper will perfectly match up together, unlike any other ripped piece of paper! Same thing with DNA. Once enough complementary bases are in a strand of DNA, it will only fit perfectly with its exact match. Even though DNA normally sticks together, it does separate – when heated up! In order to separate the DNA, the solution containing the DNA is heated up to between 95 to 98 degrees Celsius, near-boiling. At this point, the DNA peels apart into the two different strands, but doesn’t fall apart quite yet. Now, the enzyme that copies DNA is known as polymerase, and it’s a big, complex protein. Polymerase attaches on to an exposed single DNA strand, and builds the complementary strand of the DNA. Bam, DNA copied! Unfortunately, it’s not quite that easy – there are a couple requirements of polymerase, however, that make it a little tricky to work with. The first issue, which made PCR impossible for a long time, is the fact that polymerase is heat-sensitive. If you heat the protein up too much, it acts a bit like a spaghetti noodle – it falls apart, and no longer performs its DNA-copying function. Even if you cool it back down, it is still broken. Now, when you have to heat up the DNA to separate the strands, this becomes an issue. The way to solve this problem is actually rather ingenious, in terms of biology. In some hot vents, such as those found in hot springs in Iceland or at the bottom of the ocean, certain bacteria (known as thermophilic bacteria) are able to thrive. In order to survive in the boiling-hot water, they have evolved special forms of enzymes that remain stable at very high temperatures. The polymerase used in PCR comes from one of these bacteria, T. aquaticus, and is thus known as Taq polymerase. It doesn’t break down in hot water! The other issue with polymerase, however, is that it can’t start on just a single strand – it needs to start on a double strand. This means that if you chop a bit out of a double-stranded piece of DNA, the polymerase can copy that area missing its complementary strand. If you have a single strand by itself, however, there’s no place for the polymerase to attach. Now, in order to get around this problem, two different short pieces of DNA, known as primers, are added to the mix for PCR. These primers are usually 8-10 bases each in length, and are specially selected to perfectly fit the DNA strands at either end. This means that the primer forms a very short section of double-stranded DNA, allowing the polymerase to attach! The last thing needed for a PCR to work successfully is the raw ingredient – the bases that DNA is built from! These are easily synthesized, and are added to the mixture so that the polymerase has raw materials to use to build its strands. 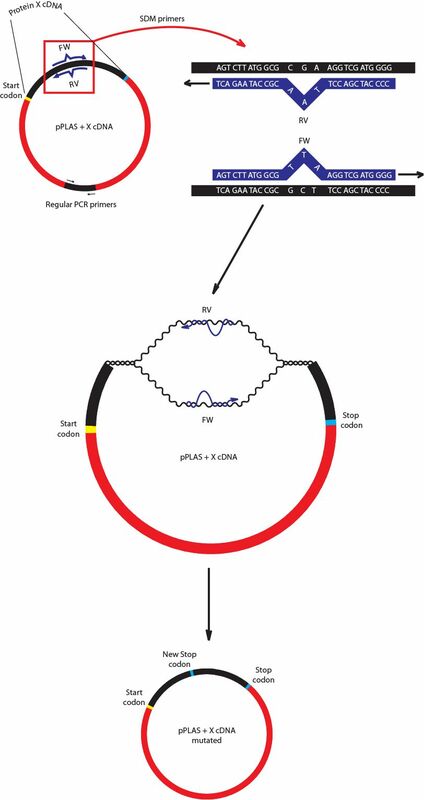 So, PCR goes through three steps – denaturing (where the DNA separates into single strands), annealing (where the DNA is cooled off enough for the primers to bond to either end of the single DNA strands), and elongation (where the polymerase attaches to the DNA at the double-stranded primer, and then builds the second strand down the rest of the length of the strand). Each of these steps is performed at a different temperature, so a PCR machine, also called a thermocycler, rotates a sample between the three temperatures. Although temperature can vary, denaturing is usually around 96 degrees, annealing happens around 58 degrees, and elongation is generally at 72 degrees. The thermocycler simply keeps on cycling the temperature of the sample between the three programmed temperatures. After 1 cycle, you have 2 strands. After 2 cycles, you have 4 strands. After 3 cycles, you have 8 strands. After 4 cycles, you have 16 strands. After 5 cycles, you have 32 strands. As you can see, the amount of DNA grows very rapidly! Of course, this growth stops if you run out of primer pieces of DNA or raw bases, but in general, this method allows for millions of copies of DNA to be synthesized in a half hour or less. PCR has a couple other limitations. Because polymerases don’t copy DNA instantly, there is a limit on how long the copied DNA strands can be. The maximum length of DNA that can be copied by PCR is about 10,000 base pairs, although some methods can go up to 40,000 base pairs. PCR also has occasional errors, as the Taq polymerase has an error rate of about 1 in 10,000 bases. Sometimes, the copied DNA strands aren’t perfect – and that, of course, means that future strands copied from those are also flawed. Despite this, however, PCR is a very powerful tool, and is used all the time in biology labs! And now, you know how it works! Horror Short 3: "On Repeat"
As I cruised past the “Mile 66” sign on the road, the metal briefly, brightly illuminated in the haze of falling snow by the glow from my headlights, I fumed silently, my hands gripping the wheel. Who did that whore think that she was? How dare she throw me out of her house, as if I was just another bit of garbage? She may be going through her midlife crisis, I thought furiously to myself, but that gave her no right to get rid of me, her long-suffering husband. Sure, I had given her a bit of hassle, over the years. Even I had to admit that we weren’t always the perfect couple, sometimes getting into fights. And back in my younger days, when I was still a heavy drinker, I may have even gotten physical once or twice. But never anything serious – I’d never inflicted anything worse than a bruise. And since I’d sworn off the hard stuff, I had gotten much better. My headlights caught another sign, this one flashing by the side of the car before I could read it. It was just another momentarily bright blur in the darkness, like me. I knew that I still had a few more miles of driving before I reached the turn-off for the cheap motel that was my current destination. Even in my current state, I was still plenty capable of operating my car. And I was used to these roads – their ice didn’t bother me, and I could drive through the heavy, silently falling snow. And, damn it, it was my car! Just like it was my house, my life, that I had worked hard to build. And Sara, that insufferable woman, had fit into the plan at first. She had been young, blonde, pretty, the perfect lady to hang off my arm at parties, to dazzle my bosses with her smile and wit, to rub against my body in the bedroom. At first, it had all seemed to work out. She had been everything that I had wanted, had hoped for, and more. But maybe it had been too perfect. She had been smart, too smart. She took away my liquor, stood up to me when I confronted her about it, didn’t back down like a woman was supposed to. I’d had to hit her. There hadn’t been any other choice. Another sign appeared. This time, I was able to have my eyes up, to read it. “Mile 66,” it read. I blinked a couple times. Hadn’t I passed that one before? I tried to remember, but my head was fuzzy. I shrugged and kept on going forward. Mile 66 meant that I wasn’t there yet. Tonight . . . tonight, things had boiled over. All I had wanted was a couple of beers, after work, but that damn woman had come in. I had tried to cop a feel, show her that I was in the mood, but not only did she shoot me down, but she started yelling at me, not relenting. All sorts of crap. I wasn’t what she had married, she wanted a real life, I didn’t care about her – all of it crap. The next road sign, approaching. This time, I made sure to slow down, braking cautiously on the snowy road. “Mile 66,” the sign read. But this time, I knew that I had passed this sign, had driven more than a mile! I looked down at the odometer. Last time I’d checked the car, it had been sprouting eighty-something thousand miles. I didn’t remember the exact number. But now, it had almost all been rolled back to zeros. “2”, the counter read. A tremor of fear, a strange and barely recognized feeling, suddenly wormed its way in through the anger. Steering back into the road, I floored the accelerator, shooting down the middle of the street. It didn’t take long, maybe ten minutes, until another sign was visible behind the wall of falling snow. I made sure to slow down carefully, staring out at it. “Mile 66,” I read off. Horror Short 2: "Cut Off The Head"
The man staggered forward, both hands pressed against his side through the bulky overcoat. The wound was still leaching blood, and he knew that it wouldn’t close. Not until after he had turned, at least. As he hobbled past the makeshift barricades, he could see eyes, innumerable pairs glowing in the twilight. They didn’t approach, though. They could smell his injury, feel the heat radiating from his clammy skin. They knew that he was infected, would soon join their ranks. The man lifted his head, blinking as he tried to focus. He knew that the Engine lay ahead. He had worked with the others, the shattered remnants of an obsolete race, figuring out its location. The Contagion Engines, downfall of humanity! Creators and controllers of the virion plague! In the dim light, now, the man could see the outline of the massive Engine, complex networks of pipes feeding into the giant, hulking Genesis Sphere. Exhaust vents, aimed upwards, spewed its toxic spores into the sky, a cloud of plague. Gritting his teeth, the man hobbled closer. Now, in the shadow of the Engine, he saw movement emerging from the darkness. The Guardians. Hundreds of insectile eyes gazed down towards him as the Guardians chittered to their next meal. The man had known that the Engine would not be undefended. He drew his pistol with a shaking hand, pointing it towards the Guardians. They buzzed back at him, still slinking forward. They knew that the pistol wouldn’t penetrate their overlapping chitin plates. One, more daring than its fellows, moved forward as it unsheathed its pincers. The man’s aim was unsteady, but he pulled the trigger, and felt a small twinge of satisfaction as the Guardian erupted into flame. The armor-piercing incendiary shell had burned through the chitin, roasting the abomination from the inside. At least his one shot hadn’t been wasted. Leaning forward, the man forced himself into a run, past the uncertain Guardians towards the Engine. His other hand dipped into a pocket and his jacket blew open, revealing the heavy vest that covered his wound. The cloth was sodden with blood, but the electronics were sealed and insulated. The man’s hand emerged from the pocket, clutching the detonator. Standing before the Genesis Sphere, the man turned to face the Guardians, struggling to draw breath as they moved forward to defend the Engine. For one last second, he spread his lips, revealing a toothy, rictus grin. He didn’t know if the creatures could understand him, and he didn’t care. “Cut off the head,” the man rasped, and slammed down his thumb on the detonator. I shook my head fervently. “No, no!” I cried, trying to retreat further. I was against the wall, however, and she stretched out her hand towards me as I flinched. For just a moment, I felt the touch of her fingers against my hand, soft and calming. I saw her mouth begin to open for an instant, but no words came out. Perhaps she could already feel herself diffusing. And then, before my eyes, she broke apart, vanishing into puffs of smoke and fine particles. Just like everyone else I touched. I stared around at the empty, ruined lab, that had seemed so full of promise just this morning. The field had collapsed, and I was the last one left. The rest were gone forever, unraveled out of existence. I lifted my hands, holding them, trembling, before my eyes. Death, death to anything I touched. Very carefully, no longer holding back my tears, I pressed both of my hands against my head. I closed my eyes as the rush of heat engulfed me. Author’s note: This is a brainstorming post. It will make no clear sense, most likely. But I need somewhere to write my ideas down and get them in order! Meridia is a normal person, she likes to believe. She’s off at college, taking classes, casting dreamy eyes towards the princes who are practicing fencing on the green during the morning between scurrying from building to building. Now, she knows that most people are destined to remain normal, to end up marrying a baker, a miller, a farmer, or an investment banker. You know, normal lives. However, for a few lucky girls, those who have the perfect combination of luck, talent, and work ethic, they transform – into princesses! These girls, perfect in every way, grow up to marry the princes, taking their pick of the cream of the crop of men and living a charmed life. Obviously, everyone wants to be a princess. No one’s quite sure why some young adults, seemingly no different at childhood from everyone else, become these paragons of beauty and grace. There are plenty of geneticists, psychologists, and anthropologists studying the princesses, searching for a root cause, something for which rich parents could pay lots of money in exchange for giving their child a charmed life. Unfortunately, no one seems to be making much headway. Summon up dresses, ball gowns, crowns, and other princess-like accompaniments (shoes. Lots of shoes). No one’s quite sure where they come from. There’s actually a decent aftermarket for items worn by princesses, and many princesses are able to make a decent second income by selling their items online. Sing. Sing with perfect, golden, dulcet tones. They are absolutely loved by choirs. Stay in relatively good shape, thin and limber, no matter how much they eat or exercise. Something about them just makes them abnormally healthy, apparently. Encourage living things to grow. Flowers bloom with their kisses, grass sprouts up under foot. Makes them great for gardening, horrible for clean room environments. This only seems to work on plants, however; no healing wounds with it. Have persistently good luck. Somehow, things always seem to turn out well for them. Several casinos in Vegas have even considered banning them, but they do bring in a lot of onlookers and admirers (who can also break into spontaneous dance numbers). Clearly, princesses lead a fairly charmed life. As for Meridia, aside from some pleasant daydreams, she never really thought of being a princess. Not that it wouldn’t be welcome, but she just never believed it would happen to her. However, on the night before her midterms, a raven sitting on her window begins chatting with her. Is Meridia becoming a princess? Or is something else happening? All of Meridia’s windowsill plants keep dying. Most of her clothes seem to have turned themselves into a variety of blacks. And that annoying raven keeps on following her around, offering his sarcastic comments on everything she does. On one hand, a princess is a princess, and Meridia has always had her eye on Dulced, one of the top princes. But will he go for this strange, new, offbeat princess? Or is Meridia, despite her new changes, still going to be out of luck? What am I scared of? That’s an interesting question. Yes, I know what the question means! I heard Suzy, here, on my left, say “spiders” already. I just need to think a moment. Lemme take a sip of my beer. Okay, got it. The thing that scares me most in the world? Wasted potential. What do you mean, “What do you mean”? Do I need to explain it? Ah. Guess that I do. I’ve got a good story here. So this happened a couple years ago, back when I was still in my undergrad. Now, if there’s one thing that I’ve learned, it’s to not do your working or studying in your room! Get distracted in minutes, guarantee you. Instead, I always like to try and find a coffee shop, someplace with people around so that I can’t just start surfing the web or blaring music. Makes me keep on reading my textbooks. So I go into this coffee shop, get my coffee, and I’m looking around. Place is packed. I eventually spot the only seat left, and it’s at a table where there’s already another employee, probably on his break or something, just lounging. I head over, ask if he minds if I sit, no, please, go ahead, thank you, all of that little small talk, great. I take a seat. I’m pulling out my books and papers, dumping them onto the table as I’m digging through the crap in my backpack, and the other guy starts looking over at me and my work. Now, before I go any further, lemme describe this guy. It’s kinda important. The guy sitting across from me was definitely in middle age, if not pushing the boundaries of it. Thinning gray hair, wrinkles around his eyes and on his hands, little bit of a paunch behind that green apron all the employees have to wear, you know. Typical middle-aged guy, maybe a little run down by life. Possibly even run over once or twice by life. But hey, I’m not one to judge. The guy asks me what I’m studying, I tell him genetics, he makes the appropriate oohs and aahs. You know. Everyone gives me that sort of thing, like it’s any tougher to be an expert in genetics than it is to be an expert in medieval literature or something. But then this guy starts asking questions. And let me tell ya, he was actually asking good ones! I’m doing my best to explain the answers, pulling up pictures and diagrams from my books, but this guy got it. Let me just go back and emphasize this point. This guy got it. And this was his first time, too. Not, “oh, I took this in college but am just now remembering the details of it,” nothing like that. He knew crap about genetics, but was able to understand everything I said, and make it all fit together logically. In his head! After five minutes I was skeptical, after ten minutes I was incredulous, and after fifteen minutes I was amazed. I was sitting across from a guy that probably had an IQ in the MENSA range. But then, I start asking him about his life. “What’s your story?” – you know the drill. And man, this guy had a story. But I’ll warn you right now, it’s not a good one. Oh no, definitely not. Hold on, I need another beer. Aah, that’s better. Keeps the throat wet, you know? Where was I? Oh yeah, this guy’s story. And he had quite a story. Went off to college, and got a girl pregnant in his freshman year. Yeah, not even six months in and he’d already knocked up this girl. Not even a long-term girlfriend, some girl at a party. He dropped out, tried to help support her, but things sort of fell apart, and they never even got married. So he doesn’t have alimony, but he’s barely a part of this kid’s life, either. Sends him money, sees him every couple of months or so. So now that he’s out of college, well, this guy had to head into the workforce. And he worked a lot of low pay, hourly jobs. He eventually managed to pick up an associate’s degree, taking classes at night, and landed himself a decent financial position, but then the recession hit, and back on the street he went. Back to the hourly wage jobs. And now, he’s closing in on fifty, and still doing the same thing. No retirement, no plan for the future. Now, if you’re not feeling pretty low for this guy, well, I don’t know what’s wrong with ya. I can tell you, I was feeling it. So then, before he got up to leave, I had to ask him that one question. This is the question that, like an iceberg, has a lot more below the surface. You all probably hear it every single day, in some form. And you probably all shrug it off with a word or two, a quick little answer that just barely touches the iceberg’s tip. But it goes a lot deeper than that. This is the sort of question that can run a whole night’s discussion, just on it’s own. You all know it. You don’t know it? Well, here it is. “Are you happy?” I asked him. And oh, ladies and gentlemen, this was the killer blow, the knockout punch. Because if you’ve been following along, you know that this guy has wasted a hell of a lot of potential. I knew, from fifteen minutes of talking with him, that he was brilliant. Not even just smart. Freaking brilliant. And he had gone and tossed it all away, squandered a life on meaningless work that really didn’t live up to what he could have done. But when I asked him that question, I saw him open his mouth. Saw him start to give that reflex answer, of course, oh yeah, can’t complain, not perfect but a decent life, all of that. But then he stopped, and I saw that sorrow in his face. Saw him stop, risking his true self to a stranger. Continued from Part I, here. “Angel?” the punk repeated slowly, turning to join the rest of us in staring at the young man in the polo. We all watched, confused, as the young man’s shoulders slumped. He bent down to one side, fiddling with a shoulder bag, and then withdrew a brightly glowing circle. At first, I guessed that it had to be some sort of glow stick, joined to make a ring, but it was far too bright. The young man raised the glowing ring up above his head, holding it in the air about three inches above his short, bed-head styled hair. He released the ring, and the other members of the train car let out a soft but still audible gasp as it hung in the air, bobbing slightly as the young man below it shifted. “The Bourne Identity?” the punk offered. After this little speech, the angel seemed to lapse off into dejected silence. The old woman sitting in the handicapped seating area leaned forward and poked him with her cane. “What happens to us after we die?” she demanded. After a moment to think through the meaning of this, the old woman squawked wordlessly, and leapt up off her seat. She scurried to the opposite end of the train car, from where she focused on shooting the evil eye at the angel. He appeared not to notice, once again drooping his head down between his shoulders. His halo seemed to dim sadly. As we continued to provide soft words of encouragement, the angel shakily made his way back up to his feet. Once he was standing, we all felt a jerk beneath us, as the train started rolling again. In less than a minute, we were pulling into the next station. And with that, he was gone. To be honest, I still haven’t quite figured out what to make of the whole event. I was a few minutes late to work, but no one noticed. And I was certainly nicer to people for the rest of the day. A couple choice curse words aren’t worth going to Hell, you know? Listen. You ever have one of those, how can I call it, “spontaneous conversations”? Know what I mean? When you’re sitting with a group of strangers, nobody knows each other, and then by the end of a half hour you’re all chatting like you’ve been mates for years. They don’t happen often, but when they do, it’s great. Even if you all never see each other again, it’s a little glimpse into someone else’s life. Anyway, I had one of those today. And man, was this one a doozie. I had gotten onto the subway, off on my usual forty-minute commute downtown. It’s a Thursday, which I personally consider to be the worst day of the week. It’s day four, the week is dragging along, but you still don’t quite yet have the weekend to look forward to yet. Everyone’s grumpy and short-tempered on Thursdays. I got onto the train with no problems, taking a seat between some young punk, dressed in a leather jacket covered in patches and sporting purple and black spiked hair, and an older man with a thin shock of white hair behind his ears. Both of them begrudgingly made room for me, just one more middle-aged guy in a business suit, headed off to a long day’s work in a stuffy office somewhere. About fifteen minutes later, however, stuck halfway between a couple of stations, the train began to unexpectedly slow down. We all glanced up from our distractions. I had been leafing through a couple financial documents without much interest, but now looked up, as did the other passengers. I took this chance to glance around. For a weekday morning, my compartment was surprisingly empty. Aside from the young punk and the old man, there was also a brown-haired woman who looked to be about my age, similarly dressed in a pantsuit. A young man, probably in his mid to late twenties, was lounging across a seat, dressed in slacks and a polo. A very old woman was sitting uncomfortably in the handicapped seats, a cane leaning against the plastic next to her. As the car slowed down, coming to a stop in the darkness, they all looked up, unsure of what was happening. A moment later, we heard the metallic rattle of the PA system. “Sorry, folks, but it looks like there’s a bit of traffic up on the station ahead,” came an indeterminate male voice, not sounding very sorry at all. “We’ll be sitting here a few minutes.” Click. The voice ended without offering any further details. “Great. Now I’m going to be late. Just frickin’ great.” To my surprise, this loud complaint was voiced sourly by the old woman, still rocking slightly on the bench. “You? Last week, my boss caught me sneaking in late.” The woman who looked about my age was speaking. “If he catches me late again, I’m going to be fired. Fired! Can you imagine finding another job? In this economy?” Her voice was rising, beginning to approach panic. The young man in the slacks and polo leaned forward and gave her an uncomfortable pat on the shoulder. “So what? I’m gonna be late for my date!” shot back the punk kid with the brightly colored hair. He caught me rolling my eyes, and withdrew slightly. “Matters to me,” he muttered to himself. “I’m late for a hospital appointment!” the old woman screeched. We all turned. The young man in the slacks and polo was standing up. As we all stared at him, open-mouthed, he slapped his hands over his mouth, his eyes going wide.